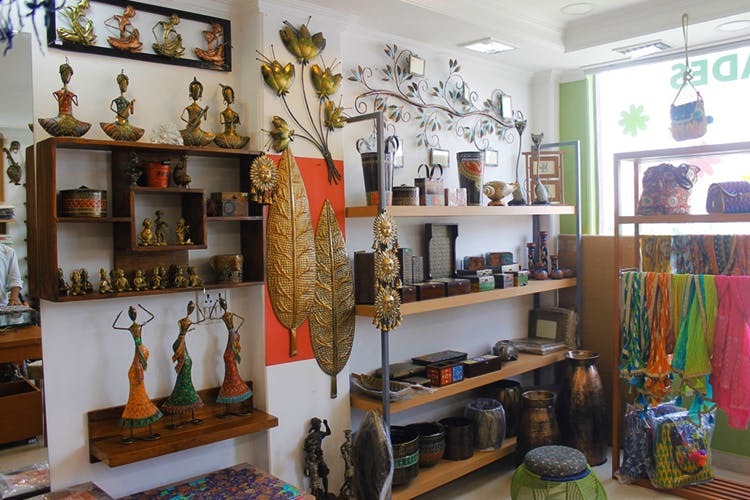 A lesser known gem in Sector 50, Swades–Reflections of India, is a bright, sunny space that’s stocked to the brim with colourful artifacts, bed linen, photo frames, bags, silver jewellery, lamps, dupattas, and even fabrics. In times when the world’s going all modern and minimal, indigenous crafts and block-printed bed covers are a breath of fresh air. The store, aptly called Swades, has everything made by artisans, who hail from different parts of the country—it obviously helps that the couple who run this are well-traveled (they made sure they found gifted craftsmen everywhere they holiday-ed). When you walk in, rest assured that you’re getting the real deal. When they say ikat or phulkari, they don’t mean the same old variety. Even their indigo and ajrak have that rustic, imperfect charm that every piece that’s handmade proudly wears. Stacks and stacks of hand/block-printed bed sheets and dohars have a piece of our heart, because even if our small pad doesn’t deserve these beauties, we know our mum would lose her mind over these. We’ll just say this: The bed linen here is very Fab India-esque (design-wise) and great value-for-money. If your best friend, mum or colleague’s birthday’s coming, get them a bag (they've got really funky slings and totes with pompoms, embroidery and co.), silver trinkets or leheriya dupattas. We promise they’re bound to make any indie hipster go weak in the knees. P.S. The price tags are in line with what everything handmade costs and, because there’s no concept of cutting corners here—we think it’s fair. In fact, you’re also helping keep cherished crafts alive by buying from here. Just to give you an idea, single bed sheets start at INR 450, dupattas at INR 300 and brass knick-knacks at INR 120 onwards. The location. Making a trip all the way to Noida is a task, but it's definitely worth the drive.